Over $850,000 raised with over 680 donations! 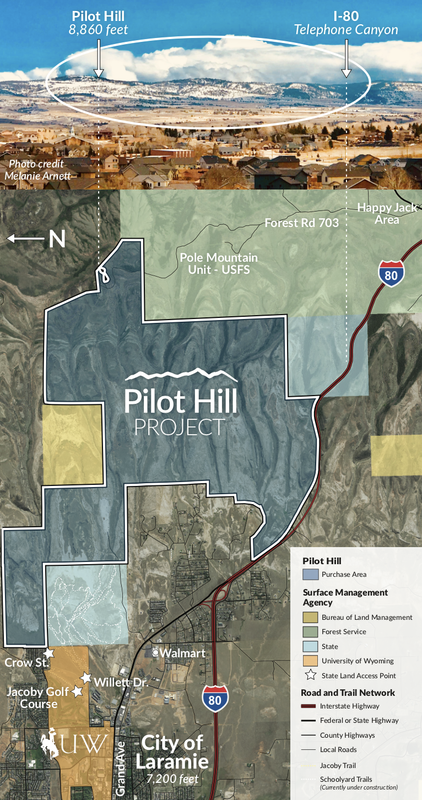 The objective for the Pilot Hill Project is to preserve 5,500 acres of undeveloped open space east of Laramie in order to protect the Casper aquifer drinking water resource, enhance recreational opportunities for residents and visitors, and promote economic development by providing a world-class natural amenity to attract and retain businesses and their employees. Have questions or suggestions about the purchase? Want to get involved? Follow our Facebook feed here, or connect with us below. We'll be regularly updating our Facebook page, and have future plans to send out email updates. March 10, 2019...UPDATE: Pilot Hill purchase deadline extended, public tours for planning proposed. [PRESS RELEASE] Laramie, WY —Albany County recently secured an extension of the deadline to purchase the ~5,500-acre Pilot Hill parcel east of Laramie, thanks to ongoing progress of a proposed state land exchange. Warren Livestock, the current owner of the Pilot Hill property, offered the purchase agreement extension last week and the Albany County Commissioners voted to approve the amendment in a special meeting on March 7, 2019. This marks the second extension granted to the project. “This extension is a sign of confidence on the part of Albany County and Warren Livestock that a proposed state land exchange and purchase will come to fruition,” said Pilot Hill Project committee chair Chris Rothfuss. The amended contract maintains the seller’s requirements from the original purchase agreement signed in 2018 and adjusts the timeline on some of the restrictions from a 50-year term to 25-year term to accommodate the land exchange process. After an initial burst of successful fundraising that gathered more than $850,000 in pledges and donations for the project, the Pilot Hill Project committee identified that a state land exchange as perhaps the most feasible way to raise the $10.5 million purchase price. The committee approached Warren Livestock with the idea, and the state land exchange process is now well-underway, Rothfuss said. In fall 2018, the Office of State Lands began its internal process of proposals and appraisals. According to state rules, state land exchanges must consolidate state land holdings and improve public access, among other requirements. Such exchanges typically identify isolated state land sections with little or no public access and sell those parcels to raise funds to purchase a consolidated parcel for public benefit and revenue generation. The State’s land exchange process will include a public review of the proposal and opportunities for comment later in 2019, followed by a final vote by Wyoming’s State Land Board. That in turn would lead to a completion of the $10.5 million purchase of the property by the state and activate a recreational lease to Albany County. The purchase will be buoyed by $850,000 in community donations and pledges already committed to the Pilot Hill Project that will likely support the initial park development costs. The committee anticipates needing an additional $700,000 for full development of infrastructure and trail building. The Pilot Hill committee has also committed to a multi-year effort to reach an endowment goal of more than $3 million, to support ongoing management and maintenance expenses. Multiple prospects to secure these funds have been identified and grant writing efforts are underway. As part of the contract extension, Warren Livestock has offered several opportunities over the coming months to open the property for community members to tour the Pilot Hill parcel. These experiences will help the public learn more about the aquifer recharge process, wildlife habitat needs and historic preservation opportunities. The onsite opportunities will help inform and facilitate community input throughout the park planning and design process. Critical planning steps will identify management and protection strategies for sensitive wildlife habitat, aquifer, and cultural resource areas. Additional planning will focus on design of recreation trails, and location of access points and trail systems to serve the community and adjacent landowners. “The Pilot Hill Committee is committed to creating an ongoing management plan for Pilot Hill that is inclusive of all the stakeholders and regional needs, and grounded in the unique aspects of the property,” Rothfuss said. 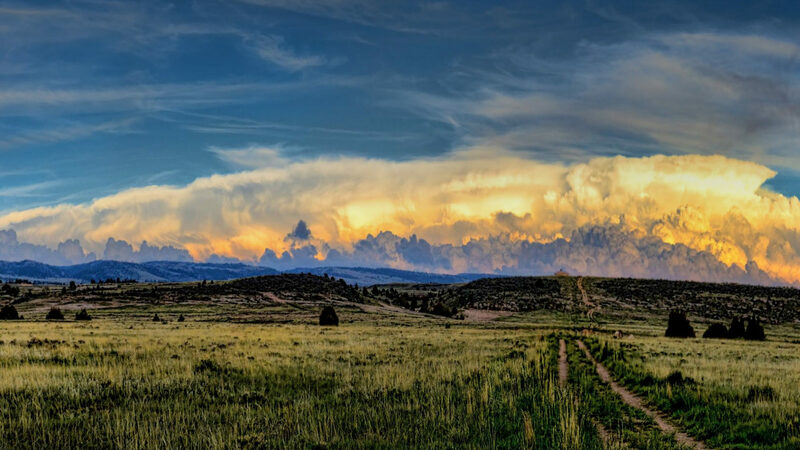 Supporting open space, clean water, and public access in the Laramie foothills. Pilot Hill Land Purchase updated their cover photo.